EPA approved Muzzle dog repellent provides safe, effective and humane protection against canine attack. Canine repellent is ideal protection for walkers, joggers, cyclists, or delivery people. Stops attacking dogs and forces them to retreat. You'll never have to be scared of another dog. Keep one with you whenever you're out. 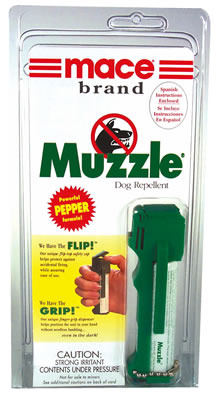 Mace brand Muzzle canine repellent is an excellent product for defending against attacking dogs. This specially formulated pepper spray is designed specifically for dogs and has been proven to be effective in encounters with aggressive canines. If a dog attacks you, spraying this repellent in it's face will stop him in his tracks. The dog pepper spray will overpower the animal and he will retreat. If you jog or take walks, then you should carry this dog spray with you. It is lightweight, easily accessible, and will provide fast protection when you need it most.